Following up the success of the first GMT-Master II model, the ref. 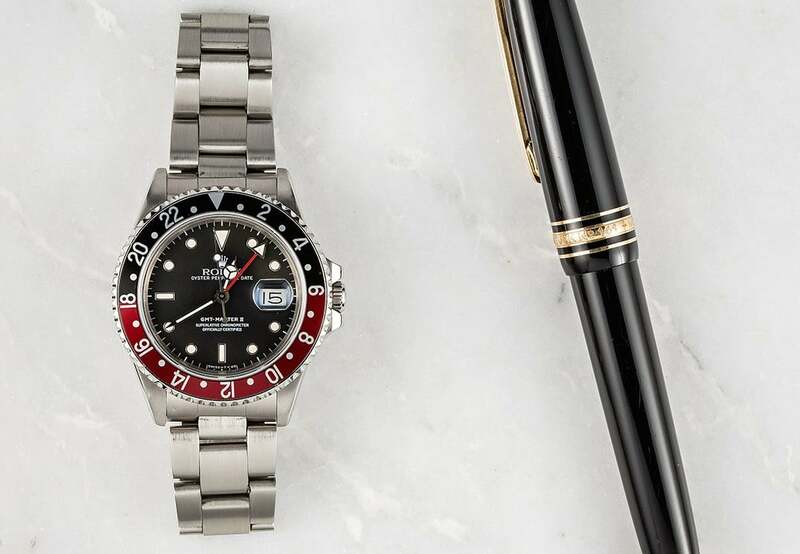 16760, Rolex unveiled the GMT-Master II ref. 16710. During its almost 20-year lifespan, the GMT-Master II ref. 16710 gained iconic status among luxury sports watches of the era. Even today, the ref. 16710 is still an absolute classic within Rolex’s archives and subsequently, a very popular discontinued GMT-Master II. The current GMT-Master II models that Rolex offers today are very different to older versions such as the ref. 16710. In fact, the introduction of the newest generation of the GMT-Master II in 2005 brought about a completely redesigned case and more importantly, a new ceramic bezel. So the ref. 16710 can be considered the last of the old guard of the pre-ceramic GMT-Master models. Let’s take a closer look at this iconic Rolex pilot’s watch. Rolex GMT-Master II ref. 16760 also known as the “Fat Lady”. The GMT-Master II ref. 16710 was in production from 1989 until 2007. While the preceding GMT-Master II ref. 16760 was nicknamed the “Fat Lady” due to its thick case size, the ref. 16710 boasted a slimmed down case thanks to the new Caliber 3185. During its long production run, the model underwent several modifications and enhancements; thus, a ref. 16710 from the late 1980s would be quite different from the mid-2000s. One detail on the GMT-Master II ref. 16710 that underwent changes was the luminescence of the watch—first beginning with Tritium, then moving to Luminova, and finally, to Superluminova. The Fat Lady earned its nickname for its slightly larger case size. Also, older versions of the GMT-Master II ref. 16710 included drilled holes in the lugs. Rolex collectors tend to favor these holes because it allows for quick strap and bracelet changes. In 2003 however, Rolex began constructing the ref. 16710 without the holes. A versatile GMT-Master II model, the ref. 16710 was available with three different bezels: the blue and red “Pepsi”, the black and red “Coke”, and the single color black option. As previously mentioned, the ref. 16710 was the last GMT-Master model to include aluminum bezels before being replaced with ceramic ones in future models. Not only does the aluminum bezel lend a vintage charm to the Rolex, but it also allows the wearer to change the bezel insert as needed. 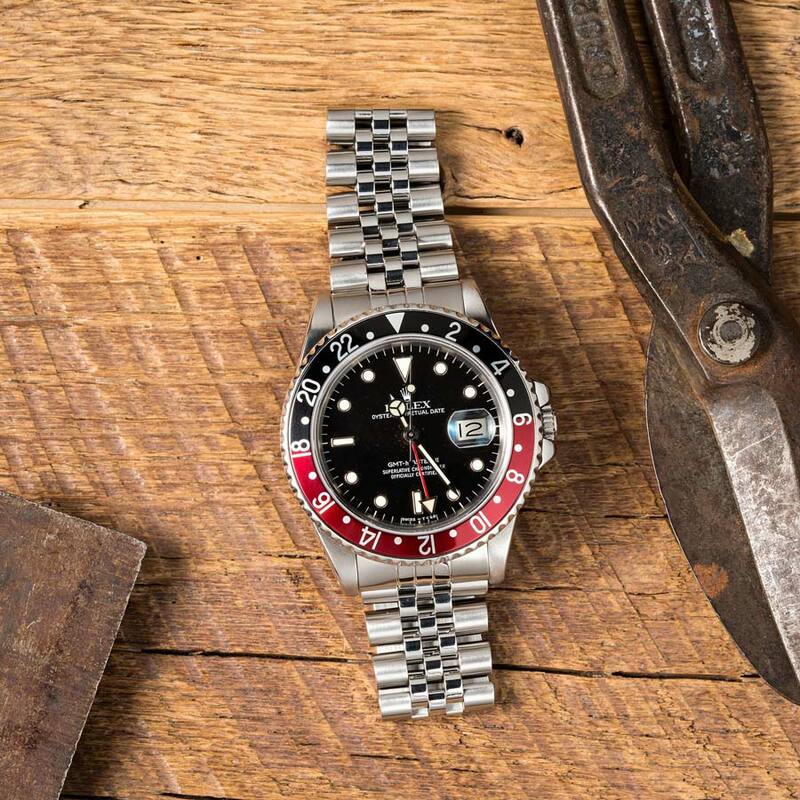 Being able to easily change both the strap and the bezel, the GMT-Master II ref. 16710 is a very customizable sports watch indeed. Early generations of the GMT-Master II ref. 16710 were powered by the Caliber 3185 operating at 28,800 beats per hour. The movement includes the hacking feature (where the seconds hands stops when the crown is pulled out) but not the quickset date feature. To change the date, the hour hand has to rotate the dial until it passes midnight. Like any other GMT, the Fat Lady was made for those crossing time zones frequently. However, unlike on the GMT-Master, the center hour hand and the 24-hour hand were independent of each other on the GMT-Master II models. Therefore, wearers of the GMT-Master II could keep track of three time zones rather than just the two time zones on the GMT-Master references. This is one of the reasons that the GMT-Master II was more expensive than the GMT-Master. This year marks the 10th year that the GMT-Master II ref. 16710 has been out of commission. Yet, its popularity (and consequently, its value in the secondary market) continues to rise steadily. While the new ceramic Rolex GMT-Master II models are certainly fantastic, there’s something to be said for the vintage appeal of the aluminum bezels of the GMT-Master II 16710. Particularly if you’re looking for a “Pepsi” bezel since the blue and red option is today only available on a very expensive white gold model and not on stainless steel. 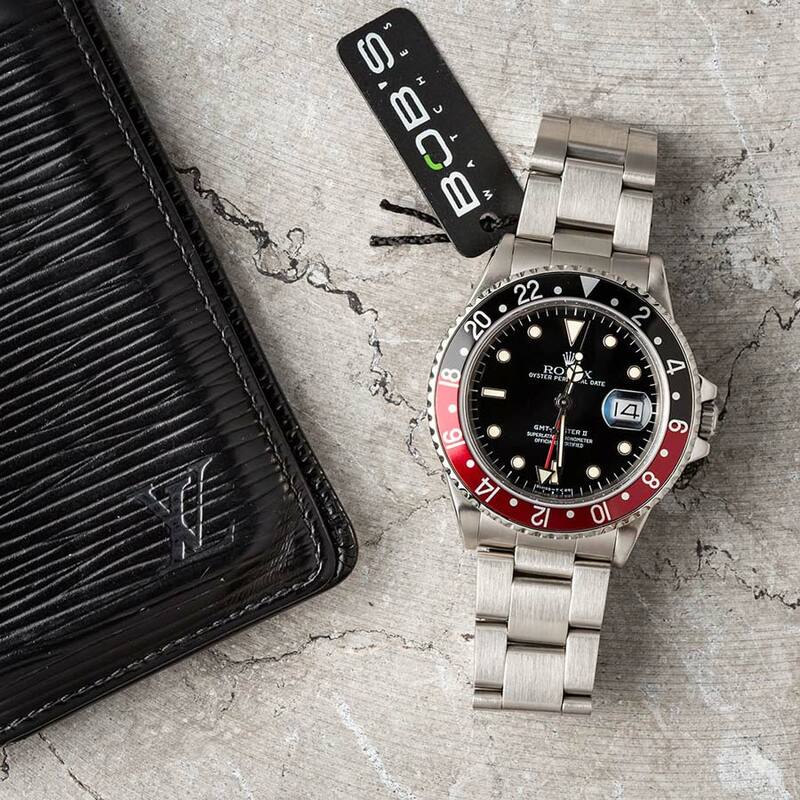 So if you’re in the market for a classic Rolex sports watch that has stood the test of time and will never go out of style, consider the GMT-Master II ref. 16710. Do you own a Rolex GMT-Master II ref. 16710? Would you consider it? Leave us your thoughts in the comment section below.